Our use of animals is a declaration that we do not consider their interests to be worth recognising. We do not consider them deserving of their own lives.... It’s all about money and consumer demand. We can buy into that, or we can be vegan. 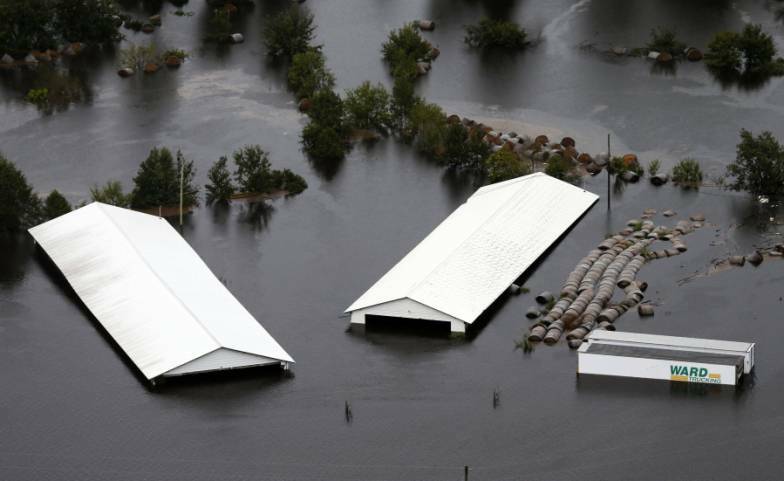 Today I’ve been sharing posts and images about the aftermath of the latest hurricane in Carolina; sharing the stark aerial photographs of what have become flooded tombs for millions of defenceless individuals whose lives and bodies were being ‘farmed’ to satisfy the consumer demand for their broken lives that is regarded as ‘normal’ in this world of ‘animal lovers’. It’s clear that for many these images are a real shock. There is horror and outrage and grief. There is frustration and anger and demands to know how this could be happening, as the toll of the dead creeps upwards from the 3.4 million (3,400,000) chickens and turkeys, and 5,500 pigs acknowledged in the media some 18 hours ago. I understand the frustration expressed by so many that the imprisoned animals who are still drowning as I write, were not given even the dignity of being released to at least try to fend for themselves. The reason this doesn’t and will never happen is because these individuals are business assets and resources in the view of those who use them to make money. They are property in the eyes of the law and the insurance companies. That’s what we are buying into when we use our consumer power to demand broken bodies and broken lives. Our use of them is a declaration that we do not consider their interests to be worth recognising. We do not consider them deserving of their own lives. Those who own the sites where the animals drowned will be able to make insurance claims for ‘assets’ lost ‘in production’, just as any of us would make a claim for property damaged or lost in a flood. And in the same way that our claim would be invalid if we had moved our property out of our house, those who use sentient individuals to meet consumer demands would invalidate their claims if they set their ‘assets’ free. It’s all about money and consumer demand. We can buy into that, or we can be vegan. The phrase that sits in the pit of my stomach and makes me feel sick, is ‘the property status of animals’. And it occurs to me that many – even amongst those who are vegan – had never before fully appreciated all the terrible implications of this phrase. It’s one that many activists, including myself, have used – but it’s clear from the stunned reactions I’m witnessing that not everyone has recognised the true meaning of the words; what it truly means to be ‘property’ in a disaster. This, then, is the reality for living, breathing, feeling ‘property’. ‘The property status of animals’ is not some legal technicality that prevents every other species from sharing in the privileges that humans accord themselves in this world that our species is destroying with greed and ignorance. ‘The property status of animals’ is a phrase with very real and utterly predictable consequences that are as sickening as they are inevitable. These consequences lead directly from our commitment to eat flesh, eggs and breast milk, to use and enslave other beings as resources and commodities for what – as it is completely unnecessary – can never be anything more dignified than a trivial and superficial indulgence, no matter how we seek to justify ourselves with talk about being ‘humane’ and ‘compassionate‘. But they shouldn’t be hurt! Be ‘humane’ and ‘compassionate’! Such words mean nothing at all once we have decided that the life of another sentient being has no value other than to indulge our non-essential interests; once we have decided their desperate wish to live unharmed and in peace is an irrelevance. Words that seek to make us appear concerned about the treatment of our unnecessary victims are at best an attempt to salve our conscience while we keep our eyes averted from the queues of defenceless young individuals in our slaughterhouses to satisfy the demands that we are making as consumers. The fact that our victims are property – like trucks and furniture and machines – in the eyes of the law, underlines and emphasises that whatever the rhetoric of feigned love and concern that we hear from those whose businesses may lose money because their assets have been abandoned, starved, deprived of fresh water and ultimately drowned before their commercial value was recouped from the slaughterhouse, those whom our consumer demands have designated as resources have no protection in law whatsoever. The following link to a talk by Lesli Bisgould, Canada’s first animal rights lawyer, provides a succinct explanation about why the ‘laws’ that we fondly imagine to protect those unfortunates within systems that are designed to use them to death for profit, do not, can not and never will provide any level of protection. Ms Bisgould also provides an explanation why, as long as their ‘property status’ remains, our victims will remain victims. Watch Lesli's TED talk on Youtube: - It's time to re-evaluate our relationship with animals. Keeping it in context – what can we do? It’s really important to contextualize it all, though, because focusing simply on the drowned victims is a small part of the larger story here. The greater tragedy is the system that would have killed them anyway, and the continued demand for their dead bodies. Any time the general public is forced to stop and think about what these farms are–which I think is going on now, to some extent–is meaningful. It needs proper context, though, to reveal the larger problem. It needs to be emphasised that horrific as this latest tragedy is, it is a symptom of a greater ill. In this world that our obsessive and inappropriate use of others is rapidly bringing to its knees, science tells us that these extreme weather events will continue to occur with increasing frequency. We can’t legislate away the problem that is causing our planet and her miraculous diversity of life to falter and die; it’s gone way beyond that. The answer needs to be much more effective and much more creative. And surprisingly, the answer is within our reach – yours and mine. The answer that can bring this hideous nightmare to an end is one that needs each of us as an individual to act upon. Only by becoming vegan and working for a vegan world can any of us cling to a hope of this beautiful world having any future at all.